Indian Institute of Geomagnetism (IIG) has taken a new initiative in establishing the Shillong Geophysical Research Centre (SGRC) as its third regional centre. 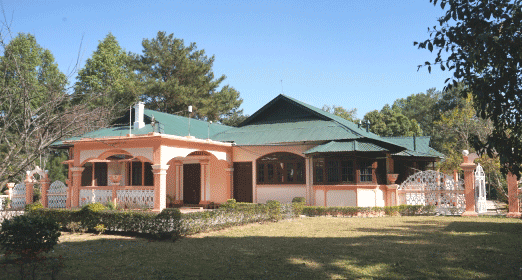 The focus of research at this newly formed centre at Shillong would be on deciphering the pre- and co-seismic signatures in various atmospheric regions over the North-East India using a variety of observational techniques aided by numerical modelling tools. SGRC is functioning from Wilton Hall estate, a picturesque location in upper Shillong in Meghalaya. The geographic co-ordinates of SGRC is 25.570N & 91.880E. Shillong Geophysical Research Centre was inaugurated on 18th January 2016 by Hon’ble Union Minister for Science and Technology and Earth Sciences, Dr. Harsh Vardhan, in the presence of IIG's Governing Council Chairman and Members, RAC member, Institutes Director distinguished dignitaries from the local, state and central government and other scientific organizations in the NE regions such as IMD, NESAC, NIC and NEHU among others. Honourable minister lauded the effort of Indian Institute of Geomagnetism (IIG, a premier research organization under Department of Science and Technology) for its initiative of setting up of SGRC and its pioneering research in Geomagnetism. Director, IIG highlighted the unique interdisciplinary academic design of SGRC to understand the dynamically coupled LAIM (Lithosphere - Atmosphere – Ionosphere - Magnetosphere) system, thereby facilitating scientific endeavours in several diverse fields of Geomagnetism and novel earthquake monitoring and precursory studies. He emphasized the need for establishment and development of experiments for multi-disciplinary studies at the regional centre. The activities at SGRC covers the field of geomagnetic research, seismology, upper atmospheric and ionospheric studies. Various geophysical instruments such as broadband seismometer, accelerograph, Radon monitor, water level meter, GPS, GNSS, Induction coil magnetometer, Overhauser magnetometer and fluxgate magnetometers are already functioning at SGRC. As is widely recognized, the north-eastern part of India is located at the centre of one of the most active earthquake prone regions of the country. The region and the tribal population therein are quite vulnerable as was evident during the recent Manipur earthquake of January 2016. Studies to be undertaken at SGRC will contribute to a better understanding of the earthquake sources and their generation mechanisms leading to an improved characterization of earthquake occurrence and hazards and assessment of the threats they pose to the local population in the North-East. Any early warning signals emerging from the earthquake preparatory zones that can be detected by observational tools to be deployed at SGRC will help in mitigating the effects of impending earthquakes in the region. The ultimate challenge is to develop an earthquake precursor model based on varied observations of the atmospheric and ionospheric response to earthquake occurrence in order to build an Integrated Earthquake Precursory Signal System (IEPSS). SGRC would strive to serve the needs of the NE region as a prominent seat of geophysical research and learning. The proposed multi-parametric study to be initiated at the Shillong regional centre in an across the discipline manner is a modest attempt towards identifying the anomalous seismic zones in North-East India to understand the generation mechanisms of great earthquakes in the region.